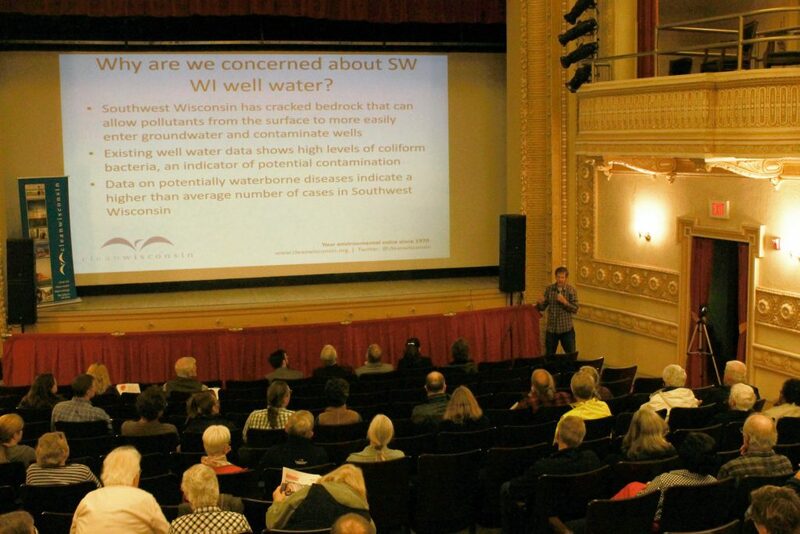 While Game 5 of the NLCS Playoffs was taking place in LA between the Dodgers and Brewers in mid-October, over 75 Southwest Wisconsin residents turned out in Mineral Point to learn about drinking water quality in their communities and a new multi-county effort to protect it. Drinking water contamination issues continue to surface around the state, and now some Southwest Wisconsin counties are stepping up to get on top of potential well water contamination issues there. Grant, Iowa, and Lafayette Counties have been in discussions for months to initiate and fund a comprehensive study of their private wells. The Southwest Wisconsin Groundwater and Geology study, or SWIGG, will combine and leverage the resources of Grant, Iowa, and Lafayette County to conduct a broad survey of well water quality in Southwest Wisconsin and then use that data to see if wells are contaminated, where that contamination is coming from, and to identify what could be done to address it and prevent future contamination. Access to clean drinking water in the state is too often taken for granted. Only around 10% of private wells in Wisconsin are tested for contaminants like bacteria and nitrates even though evidence shows that in certain parts of the state, well water pollution is a growing problem. Bacteria and high levels of nitrates in drinking water make people sick, and they can be especially dangerous for pregnant women, babies, and young children and other folks with weaker immune systems. Southwest Wisconsin has some of the highest levels of coliform bacteria pollution in the state. The region also has higher than average numbers of cases of potentially waterborne diseases like Salmonella, E. coli, and Cryptosporidium. With this concerning public health data in combination with the fact that Southwest Wisconsin has cracked bedrock and shallow soils that can allow pollutants to enter groundwater, the counties rightly chose to step up and initiate this important study. The study will look at geological features like the types of bedrock wells are drilled into, how close wells are located to agricultural fields or septic systems, and how wells are constructed to identify where any contamination is coming from. The information gathered from the study will allow the county to take steps in the future to reduce the likelihood of contamination by adjusting construction requirements or setbacks for certain activities from drinking water wells. The breadth and depth of this study is unmatched by anything else done in Southwest Wisconsin and anything any county could do on its own. Clean Wisconsin has been calling for the state to focus on Southwest Wisconsin well water contamination for the last two years. When the state decided not to include Southwest Wisconsin in the new manure spreading rules meant to address drinking water contamination in Northeast Wisconsin, we asked the state to fund a study of Southwest Wisconsin’s well water quality. The state has not yet taken any steps to do so, but thankfully Grant, Iowa, and possibly Lafayette County are looking to fill the leadership void. While the first round of samples is set to be collected this fall, the future of the full study is more uncertain, as Lafayette County recently chose not to provide funding for the study in their annual budget. Efforts to restore funding for the study are continuing and will culminate in a decision at the November 13th County Board meeting. As these counties look towards a future where their strong agricultural traditions meet tourists, new residents, and businesses that want and need clean drinking water, this study will provide critical information Southwest Wisconsin elected officials can rely on to make sound decisions. The counties must make a robust effort to learn about their water quality, identify any potential contamination issues, and then make informed decisions to protect drinking water for current and future residents. Clean Wisconsin will continue to work with members and citizens in Southwest Wisconsin to make sure this important work is fully funded and provides these counties with the valuable information about well water quality they and their citizens need and deserve. Editor’s note: Since this piece originally appeared in the fall issue of Defender, the Lafayette County Board of Supervisors voted to contribute funding for the SWIGG study.